Another Beautiful Day in Paradise. Well....it was raining this morning in St. Pete. We did need the rain though. 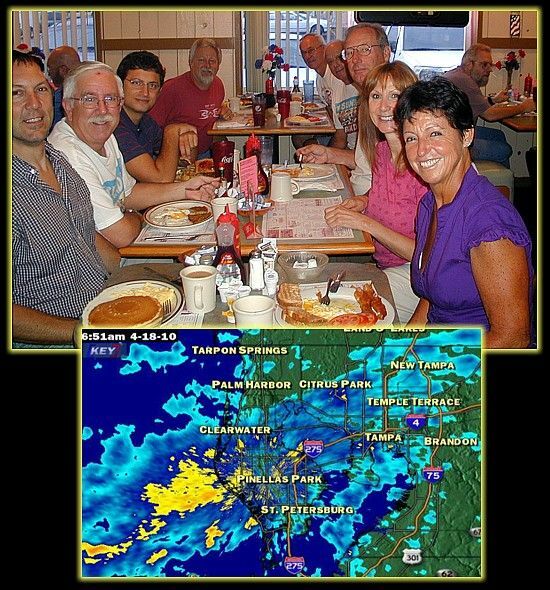 Charles C. called from Tampa and said in was also raining and wet in Tampa where our skate was planned. That just gave us another excuse to Brunch at Doe Does in St. Pete. and so we did. Nine hearty soles met at Does Does for Breakfast at 9 AM. The early arrivals at Doe Does held 10 spots close together so we all could socialize. We had a new bicyclists join us, Juanita. Absentee Deb D also joined us. Welcome Juanita and Deb D. Brunch at Doe Does was great as usual and was rated a 9+.